Stanford sends Maverick McNealy, Franklin Huang, Brandon Wu, Isaiah Salinda and Viraat Badhwar to compete against a top national field in the US Collegiate played at the Golf Club of Georgia outside Atlanta. The event is hosted by Georgia Tech. Salinda and Badhwar will be in their first event of the new season after sitting out the first tournament played at famed Colonial CC where the Cardinal tied for 6th and McNealy won individually for his record-tying 11th career collegiate win. The strong field of 17 teams is shown above includes 6 of the nation's top 10 teams, Oklahoma State (2), Auburn (3), LSU (6), Virginia (7), Oklahoma (8) and Wake Forest (9). Stanford comes in ranked 13th. Temperature at the start of round 3 was 43 degrees, winds light (3mph). Forecast is for clear skies all day, high temperature 72 degrees around 4pm. The Cardinal made a charge up the leaderboard with a final round 10-under 278 to finish tied for 3rd, only 1 stroke behind Texas and Virginia. The team's 278 final round was second best of the tournament, only behind a 277 finishing round by Texas. Final team results shown below - click to enlarge. 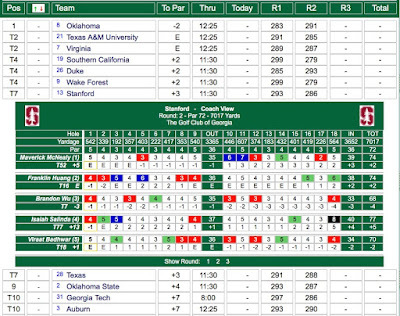 Stanford individual three round scoring below - click to enlarge. Stanford's day included three rounds in the 60s led by Viraat Badhwar's excellent 68 featuring 4 birdies and no bogies, while Brandon Wu's 69 was also bogey free and Maverick McNealy also had a 69. Franklin Huang finished with an even par 72 and Isiah Salinda had a 77. Wu (73-68-69 210 T4) finished tied for 4th, Bahwar (75-70-68 213) tied for 12th, Huang (70-74-72 216) tied for 19th, McNealy (75-74-69 218) tied for 29th and Salinda (80-77-77 234) tied for 82nd. Round 3 scorecards are shown below - click to enlarge. Round 2 began in temperatures around 50 degrees and winds averaging 10 mph, gusting to 17. Forecast high today is 63 degrees with bright sunshine all day. 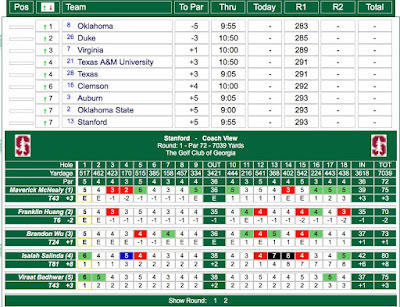 Stanford remained tied for 7th after round two but the scoring gap has narrowed to 5 shots behind leading Oklahoma in a tightly bunched field. Sophomore Brandon Wu's fine 4-under 68 (73-68 141 T7) led the way on the day, followed by Viraat Badhwar's 70 (75-70 145 T18) while 74s were posted by Franklin Huang (70-74 144 T16) and Maverick McNealy (75-74 149 T52). Isaiah Salinda's 77 (80-77 157 T77) completed the team scoring. Below is the top 10 team leaderboard and Stanford scorecards - click on image to enlarge. Round 1 began with temperatures in the upper 50s and winds from the NW at 13 mph, gusting to 22. Forecast high is 65 degrees today, sunny all day. Stanford tied for 7th after the first round a 5 over par 293. 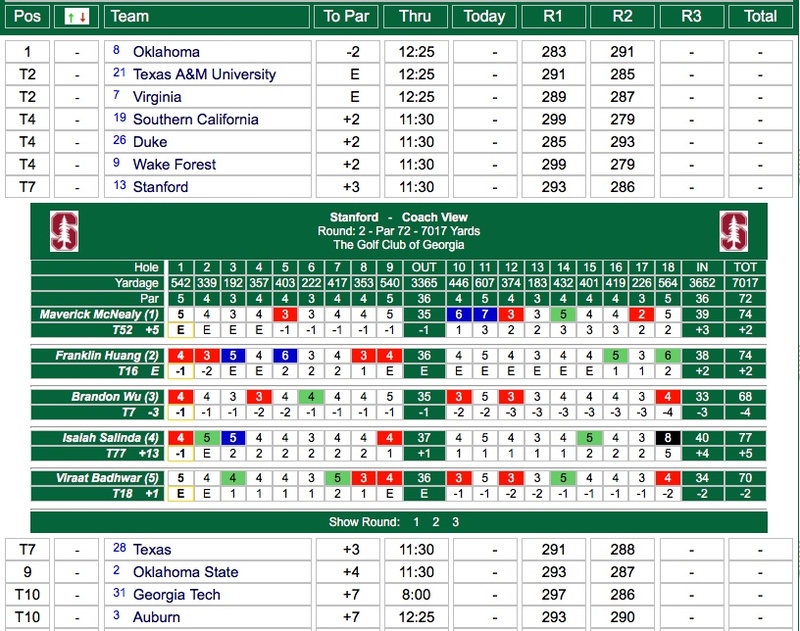 Top team and Stanford scoring is shown below as Franklin Huang led Stanford with a fine 2-under par 70 putting him in a tie for 6th, Brandon Wu had 73, Maverick McNealy and Viraat Badhwar shot 75 and Isaiah Salinda an 80 to leave Stanford 10 strokes behind leading Oklahoma. The course was challenging as the low round was a single 67 turned in by Jimmy Stanger of Virginia. 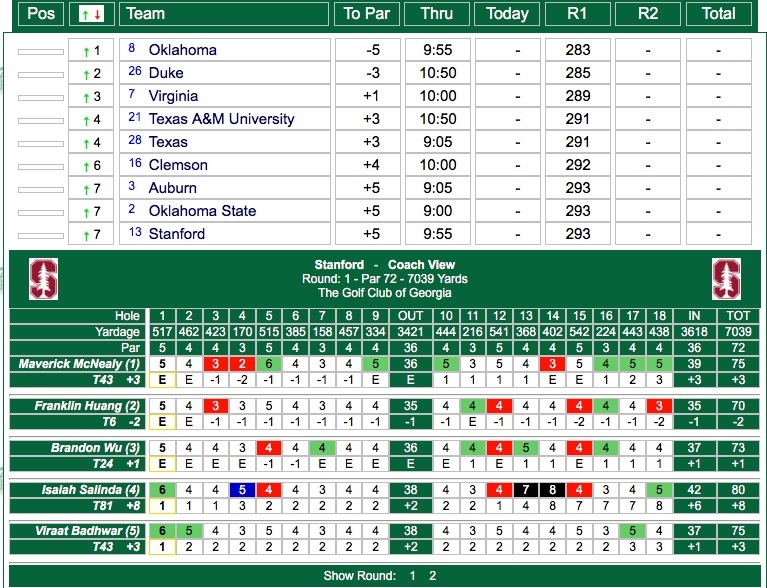 Round 1 scoring is shown below as Franklin Huang led Stanford with a fine 2-under par 70 putting in a tie for 6th, Brandon Wu had 73, Maverick McNealy and Viraat Badhwar shot 75 and Isaiah Salinda an 80 to leave Stanford 10 strokes behind leading Oklahoma. Stanford sends Maverick McNealy, Franklin Huang, Brandon Wu, Isaiah Salinda and Viraat Badhwar to compete against a top national field in the US Collegiate played at the Golf Club of Georgia outside Atlanta. Salinda and Badhwar will be in their first event of the new season after sitting out the first tournament played at famed Colonial CC where the Cardinal tied for 6th and McNealy won individually for his record-tying 11th career collegiate win. The strong field of 17 teams is shown above. Round 1 scoring is shown below as Huang led Stanford with a 2-under par 70, Wu had 73, McNealy and Badhwar 75 and Salinda an 80 to leave Stanford 10 strokes behind leading Oklahoma.